Help Japan a photo by Jerrod Maruyama on Flickr. It is very easy. I just did it and it shows up as an item in your next phone bill. I didn't even have to call or lick a stamp. After all I've seen of the devastation left by the largest earthquake to hit Japan ever--well, it's not much but it's a start. Our thoughts and prayers go out to our friends and colleagues in Japan. Lee Unkrich, director of Toy Story 3 talks about this horrific video in his tweet: This is absolutely unbelievable. For my video game friends, check out Kevin Pereira of G4's "Attack of the show" who took a break from the show to talk about texting help to Japan. Check out the video here. Thanks for cooperation of all of you. Thanks Ronnie. 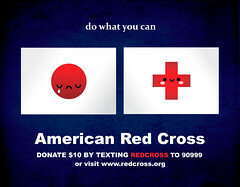 My girlfriend is from Sendai and we've sent in our donations. Hope it helps a little. Be safe, Eiji. We hope nothing more escalates from here other than miracles of all sizes. Jeremy, I can only imagine how this must be for your girlfriend. We wish for best of outcomes for everyone in Japan.